The fair held in the month of February is not only famous for the showcased items made by the artists but also it entertains innumerable people with the assortments of culturally significant handicrafts and handlooms. Gigantic wheels and other rides are there on the fair premise to amuse the visitors in a different way. Every year the festival is celebrated with a different theme. Generally a state of India is selected as a theme. Ambiance of the fair and handicrafts which are related to the particular state are mainly showcased. Almost every kind of handicraft item is there on display. More than 400 national and state awarded craft persons from the entire country and SAARC nations play a part in the craft fair. Impressive collection of adroit paintings, textiles, wood stock, ivory work, cane and grass works can surely attract huge numbers of people. Woven silk, cotton-blended saris block painted fabrics and stuffed leather toys are also included in the list of craft and handloom items. Some of the rare and atypical handicraft items of the world can be collected from this impressive fair. 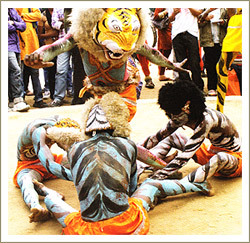 Rich folk dances and musical ceremonies are held throughout the fortnight at the famous and significant fan shaped open-air-theatre called 'Natyashala'. The animated crowd, colorful vistas of hanging lanterns and decorations will take you away from the gripe and grime of mundane city life. This is a must visit place during the festivity. If you are a food lover then the festival will not let you down. Savor the taste of plenty of south and north Indian dishes. Lassi, Payas, Uttapam, Ghevar and many more special Indian cuisines are there for you. Mitha Chawal, Kheer, Churma and Malpuas are available aplenty.